Cranes coach Moses Basena addresses journalists recently. Photo by Shaban Benteke. The Uganda Cranes have departed for Alexandria from Entebbe Airport early this morning. Just before departure interim Coach Moses Basena addressed journalists about the physical state of all the players and our chances away in Egypt. “Yes we had some injury scares towards the end of the game on Thursday as both Farouk Miya and Emmanuel Okwi went off with knocks ” Basena said. “I can assure you that both of them (Okwi and Miya) and the rest of the team are in a good condition to play on Tuesday ” he added. The Cranes boarded an Egyptian Airlines flight directly to Alexandria and are expected to arrive this afternoon. They will hold a training session at the Borg Al-Arab stadium in Alexandria on Monday afternoon before the clash at the same stadium against the Pharaohs on Tuesday evening. Moses Basena also talked about the team’s chances in Alexandria come Tuesday. “Uganda is in a position to win at any stadium against any opponent,” Basena said. “We are aiming for a win and I am confident the boys will do exactly that,” he added. Uganda lead group E with seven points, one ahead to their Tuesday hosts Egypt. Ghana who have drawn two of their three games so far have two and Congo Brazaville is rooted at the bottom of the group with one point. 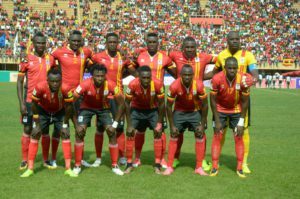 Ghana travel to Brazzavile on Wednesday after a 1-1 draw in Kumasi on Saturday. Uganda Cranes team that has travelled. Out field players: Nico Wakiro Wadada, Godfrey Walusimbi, Isaac Isinde, Murushid Juuko, Wasswa Hassan Mawanda, Khalid Aucho, Emmanuel Arnold Okwi, Faruku Miya, Derrick Nsibambi, Joseph Benson Ochaya, Bernard Muwanga, Ivan Ntege, Muzamiru Mutyaba, William Luwagga Kizito, Milton Karisa, Isaac Muleme and Geoffrey Serunkuma.